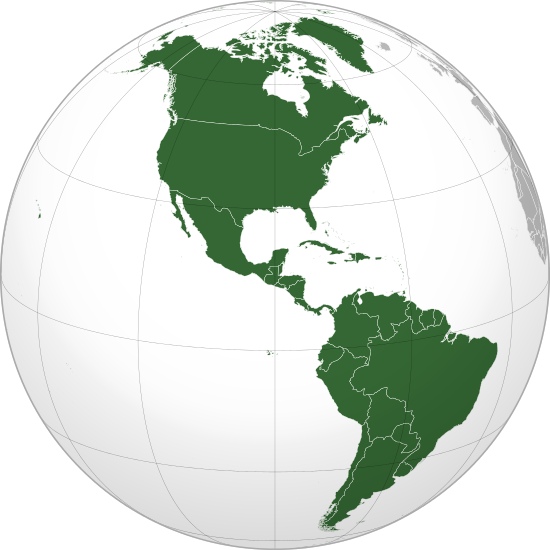 The Americas is an immense geographical region spanning two continents, North and South America, and includes the islands of the Caribbean Basin. While the Caribbean Basin is a part of the Americas, that subregion is covered elsewhere in this encyclopedia. The Americas lies fully within the Western Hemisphere. The region spans nearly 1501 of longitude extending from the eastern coast of South America at 351W to westernmost reaches of the Aleutian Islands at 1801. The latitudinal extent of the Americas runs from Arctic islands north of 801N southward to Cape Horn at 551 S. Encompassing the third and fourth largest continents, North America and South America, respectively, the land area of the Americas extends over more than 42 million square kilometer. The first recorded reference to the term ‘America’ appeared in 1507 on a map produced by the German cartographer, Martin Waldseemuller. The name derived from the Latinized spelling of the first name of Americo Vespucci. Vespucci was a sixteenth century Italian explorer and merchant who made two voyages (1499 and 1502) to the eastern coast of South America. He was among the first European explorers to recognize that they had not reached India but had discovered a new continent instead. Use of the place names (toponyms) ‘America’ and ‘the Americas’ can be problematic. As noted above the Americas is usually defined as a macrogeographical region encompassing North America, South America, and the Caribbean basin. However, the terms ‘America’ and ‘Americans’ in the common vernacular are synonymous with the United States of America and its citizens, an association that often draws howls of protest from those living in Central and South America who also claim that they are ‘Americans’ too. Which Scientific Status for Territorial Development? What Is Amenagement du Territoire or Territorial Development?